I was taught this recipe working in an Italian kitchen in high school with a really talented chef. Each time I washed a dish I would run my finger across the saucy goodness. It was too fantastic, I didn’t care what anyone though. The bacon and sun dried tomatoes complemented the Gorgonzola cream sauce perfectly. It’s like heaven in your mouth. I picked his brain until I could reproduce it perfectly. 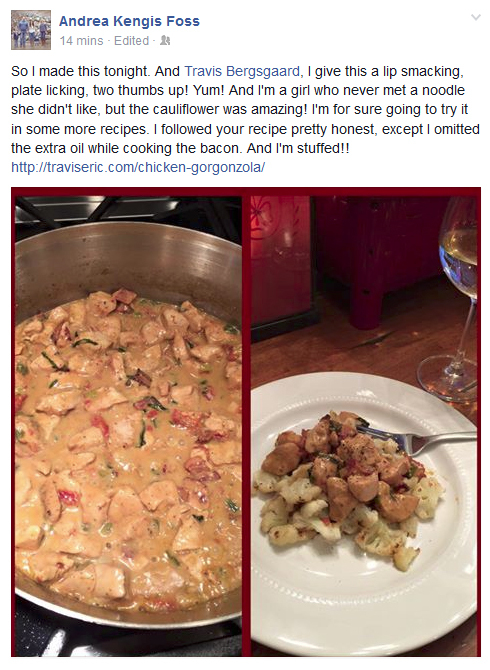 His version used cream instead of coconut oil and was served over Penna pasta rather then cauliflower. I tweaked the recipe to make it more paleo friendly and found the results nearly identical to the original I once enjoyed so much. I’ll walk you through the ingredients and the timing so you too can create this masterpiece of flavor for yourself and your loved ones. ENJOY! Ingredients: Olive Oil, Bacon, Chicken, Sun-dried tomatoes, Green Onions, Basil, Garlic, (White wine), Coconut Milk, Gorgonzola Cheese, Cauliflower, Kerry gold grass fed butter. On medium heat. Fry 3-4 slices of bacon (chopped) in olive oil until brown. Sticky pan preferred as it will create more fond (brown stuff on bottom of pan) which means MORE flavor. As your bacon cooks you have time to prep the ingredients for the next stage. The green onions, basil, sun-dried tomatoes can be plated. The chicken cubed and the garlic chopped and set aside. Here I used 3 Green Onions. Chop the ends off. Remove anything weird. Chop! Stack your basil leaves like so. Roll into tube. Chop! This is called the Chiffonade technique. “Chiffonade” means ‘made from rags’ in French. It can be used to get cool textures from your herbs to top off a dish or add flavor like we’re doing here. Add a similar portion of Sun Dried Tomatoes and set aside. Ready to add when the time comes. These come both in oil and dried. They work either way. Prep your cauliflower separating it from its giant mass. Chop the tops off from the woody steam. Saute the cauliflower in 2 tbs of Kerry gold grass fed butter or olive oil. Add salt and pepper. Add extra bacon grease/olive oil mix for extra flavor but make sure and keep some oil in the pan for cooking the chicken. Remove weird fat pieces and cut your chicken into cubes. First diagonally. Then horizontally. And cover with salt and pepper. *Stay away from table salt. Use pink Himalayan or Celtic sea salt instead. It’s better for you. Add your chicken to the pan once the bacon turns brown. The less you move the chicken around the better. You want to develop a brown on the chicken and on the pan to extract maximum flavor. This is done with a hot pan that sizzle when you add the chicken and by leaving the chicken sit in the same spot for a period of time. Prep your garlic. About half a head or so. Cut the stem off. Smash with a knife and chop as fine as you can get it! Work on those knife skills. Starting to brown! I could have even used a hotter pan to sear the chicken more aggressively for more fond. Details. Details. Add your Green onion, Sun dried tomatoes and basil as the chicken cooks. Garlic is chopped and added a minute before the chicken is cooked through. Don’t be afraid of seeing a little pink. Most people over cook their chicken and dry it out because their scared of salamandernilla. By leaving the chicken a LITTLE pink before adding the coconut milk it will cook through as the milk and cheese simmer. The chicken will turn out perfectly moist and juicy when its all said and done and reach a temperature to destroy the evil slamnaoialla. Garlic touching the pan will release its flavor into the oil and aroma into the air. The smells in the room at this point will wake a hibernating bear. Anyone else in your vicinity will have no choice but to comment. Unless their nose is all clogged up from not eating paleo. Sauteed cauliflower should begin showing signs of browning at this point. Make sure you are tending to it and tossing it about. Season with salt and pepper. As the fragrance is released from the garlic give the pan a good toss. Mix up all them wonderful ingredients. Errrmagardddd. This is also where you would add a small splathering of white wine (~4 tbs). The wine will pick up the fond from the pan and enhance the flavor profile. Add about half a can of coconut milk. Make sure and shake it before you open it as it can sometimes separate in storage. Just enough to almost cover the chicken. Then sprinkle on your Gorgonzola cheese crumbles. Too much will leave a very strong over whelming flavor. Too little and you miss out on it. Find your balance! Let it simmer 3-5 minutes until all Gorgonzola is melted and mixed in. I turned off the heat to my cauliflower when it reached the brownness and consistency I was looking for. If you don’t get the timing perfect don’t worry. You can leave either the chicken Gorgonzola or Cauliflower to sit and then warm it again before serving. Plate your sauteed cauliflower and pour over that delicious Gorgonzola sauce n mix. Dance with joy. Hope you liked this recipe! Let me know how you liked the format or if there is anything I can do to make this easier to read and follow. Or any tips you think I missed. And please let me know If you make this dish and how you liked it! Here or on a photo on instagram @travisericb! I tried this recipe last night and it was a hit! Even with the kids! It will be in our dinner rotation for sure! Please keep the great recipe’s coming! That’s awesome! Thanks for sharing 🙂 I’ll keep um coming!